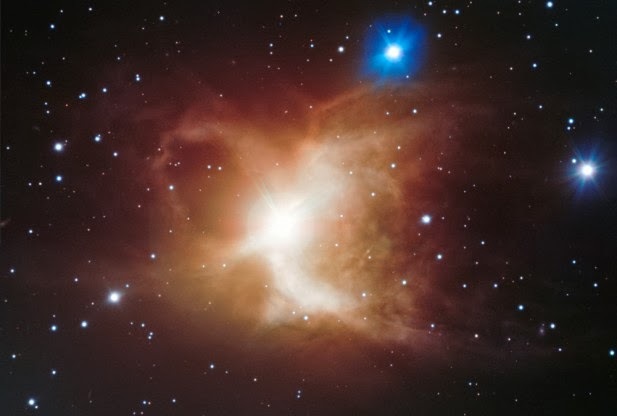 ESO astronomers using the European Souther Observatory’s (ESO) Very Large Telescope (VLT) reported today that they have captured a detailed image of the Toby Jug Nebula. The nebula featured in the latest ESO image is a cloud of gas and dust surrounding a red giant star. The image shows the characteristic arc structure of the nebula resembles a jug with a handle. 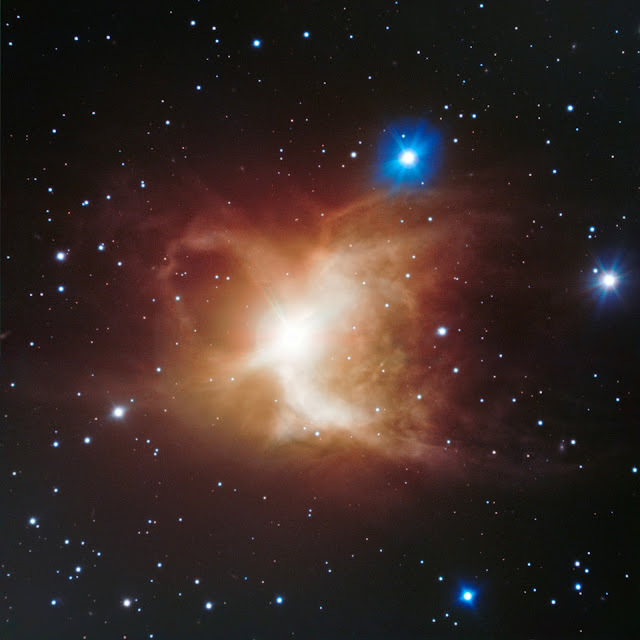 The Toby Jug Nebula, or IC 2220, sits about 1,200 light-years away from Earth in the southern constellation Carina, which is also known as The Ship’s Keel. IC 2220 is considered to be a reflection nebula because its cloud and dust is illuminated from within a star called HD 65750. This star has five times the mass of our Sun, but is in a much more advanced life stage. As some of the mass from HD 65750 began escaping the star, it started forming a cloud of gas and dust, helping to create the Toby Jug Nebula. The dust in IC 2220 consists of elements such as carbon and simple, heat-resistant compounds such as titanium dioxide and calcium dioxide. Silicon dioxide, or silica, is most likely the compound reflecting the star’s light in the infrared image released by ESO. “IC 2220 is visible as the star’s light is reflected off the grains of dust. This celestial butterfly structure is almost symmetrical, and spans about one light-year. This phase of a star’s life is short-lived and such objects are thus rare,” ESO officials said in a statement. Red giants like HD 65750 are stars that are approaching the final stages of their evolution. These stars have almost depleted their reserves of the hydrogen which fuels the reactions that occur during most of the life of a star. This causes the atmosphere of the star to expand enormously. Red giants burn a shell of helium outside a carbon-oxygen core, sometimes accompanied by a hydrogen shell closer to the star’s surface. “Billions of years in the future, our Sun will also bloat into a red giant. It is expected that the solar atmosphere will inflate well beyond the current orbit of Earth, engulfing all the inner planets in the process. By then, Earth will be already in very bad shape,” ESO said.